Welcome at pages of guest-house Hradby! 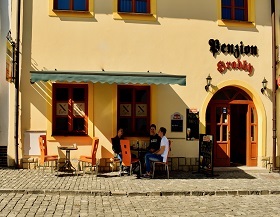 Guest-house Hradby is situated in the centre of historical town Bardejov. We offer good-class and budget-priced accommodation with 8th rooms capacity, with twenty permanent beds (with possibility of six additional beds). In every room is a bathroom with a toilet and is also furnished with a fridge and TV. It´s possible to park next to Pension Hradby without parking payment. Pension is monitoring with camera´s system. Menu and drinks from the restaurants surrounding, the possibility of orders and deliveries directly to the Pension. Town Bardejov with its 760 years old history has over 33 thousand inhabitants.The most valuable devices are cultural monuments and appearance healing founts in its near surrounding. For the protection of lendmark Bardejov and its cultural monuments , Bardejov has awarded Golden European Medal in 1986 and in 2000 Bardejov was enlisted into World Heritage List – UNESCO. 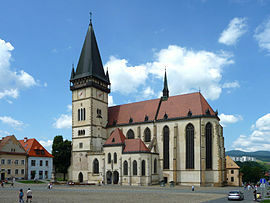 Its dominant is historical centre, The townhall square full of other monuments like church- St.Egidius Basilica and gothic-renaissance townhall. An important component of the cultural heritage is composed of wooden churches in the surrounding. The oldest church in Slovakia is located nearly 7 km away from village Hervartov.